CarGurus has 1,366 nationwide F-TYPE listings starting at $29,900. Most performance/luxury vehicle previews begin with a catalog of expensive model enhancements and end with the news that prices have gone up. So we are pleased to tell you that the 2017 Jaguar F-TYPE sports coupe and convertible is actually getting less expensive. Jaguar has been planning this lower-cost F-TYPE since 2015, as part of its “improved competitive value position.” The new base 2017 F-TYPE coupe will start at just $62,395, including destination charges, and the base convertible will start at $66,395. Jaguar says that given the 2017 F-TYPE’s added features, its new entry-level trims have a $1,700 value advantage over previous iterations. The Jaguar F-TYPE is now into its fourth year as a convertible and third year as a coupe--it is the new E-TYPE, with a bit of snarl that could easily qualify it as a hot-rod luxury coupe. Seen in person, the F-TYPE appears low, compact, and serious; although it looks great in images, it's also one of those cars that tends to draw onlookers when out on the street. The hood is long, and the tail has the clipped look that the E-TYPE wore so well in the past. The aluminum-intensive front-mid engine platform is rear-wheel-drive (RWD), with optional all-wheel drive (AWD) on specified trims. 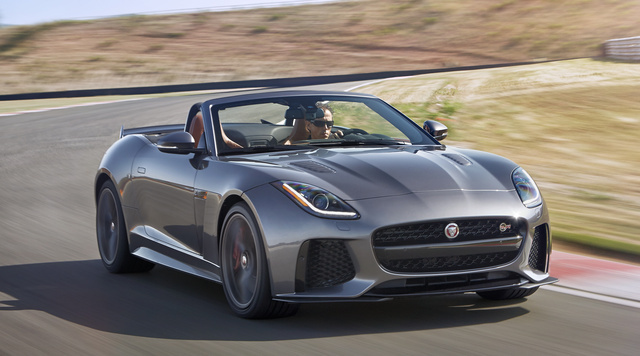 Jaguar offers two engines on the F-TYPE: a 3.0-liter supercharged V6 and a 5.0-liter supercharged V8. The exact horsepower depends on the trim, either 340 or 380 with the V6, or 550 or 575 with the V8. Paired with either a 6-speed manual or Jaguar’s ZF-sourced “Quick-shift” automatic transmission, the F-TYPE offers an engaging drive (according to reviewers). The drivetrain also features an electronic rear differential and torque vectoring that uses the brakes to ensure effective power distribution and keeps the drivetrain active during cornering. The 2017 F-TYPE's suspension starts with an aluminum chassis that offers a stiff and lightweight platform. The selectable driving modes are supplemented by adaptive dynamics: Jaguar says the F-TYPE’s sophisticated suspension software monitors the present driving situation in order to provide the appropriate amount of damping, be it on the racetrack, over back roads, in traffic, or on broken pavement. AWD F-TYPE trims include the Intelligent Driveline Dynamics system, which also adapts to changing conditions by shifting power from the rear wheels to the front. The interior of the 2017 Jaguar F-TYPE will be a very welcoming place. Leather with artificial suede microfiber trim is standard on all trims. The gauges are analog, with a center information display set between them to help the driver keep his or her attention away from the other infotainment screen. The stick shift falls perfectly to hand, and trims equipped with the automatic transmission include steering-wheel-mounted paddle shifters. Sport bucket seats come standard and can be upgraded with quilted leather or slots for a racing harness. The coupe trims even include a large rear trunk. Active air vents in the interior rise when in use and then fold neatly back into the dash when not. The 2017 Jaguar F-TYPE comes in seven trims: the base, Premium, Type S and Type S AWD, Type R and Type R AWD, SVR, and the British Design Edition. The base, Premium, Type S, and British Design Edition have the V6, the R and SVR the V8. The SVR is the full-whammy race-car F-TYPE setup, and the British Design has many of the same upgraded performance parts as the R models, but with the V6 engine. Prices top out at about $130,000. F-TYPE owners are treated to a premium ownership experience. Jaguar’s Elite Care offers a 5-year fixed cost of ownership, which includes routine maintenance and a full warranty. A recent customer survey regarding dealership service visit satisfaction ranked Jaguar number one, ahead even of Lexus. Due to low vehicle population, however, the F-TYPE is not rated by Consumer Reports or other quality organizations. As with reliability data, there is little in the way of safety data available for the F-TYPE. Safety does not tend to be an area of critical concern for many 2-seat convertible or sports coupe buyers. The convertible does sport rollover protection, however. Look for the 2017 Jaguar F-TYPE to arrive in early spring. What's your take on the 2017 Jaguar F-TYPE? Have you driven a 2017 Jaguar F-TYPE?